Today there are 67 higher education institutions in Hungary, ranging from small colleges to top research universities. These universities and colleges are maintained either by the state, private organizations or a church. In accordance with the objectives of the Bologna process the degree structure of tertiary education is based on three cycles. Nearly all study fields lead first to a Bachelor’s degree (usually 3 years), and after a further study period to a Master’s degree (2 years). However, there are some exceptions: medicine, pharmacy, dental and veterinary studies, architecture, law, teacher training, and certain arts-, crafts- and design-related study programmes, which retain a long single-cycle structure of 5 or 6 years of study. The first-cycle programmes last 6–8 semesters (3–4 years, 180–240 credit points) and lead to a bachelor's degree (in Hungarian: alapfokozat). The second cycle, leading to a master's degree (in Hungarian: mesterfokozat), lasts 2–4 semesters (1–2 years, 60–120 credit points). Two-year-long vocational higher education programmes (in Hungarian: felsőoktatási szakképzés) are also available on an optional basis prior to first-cycle programmes and lead to advanced vocational qualifications. The 120 credit points gained in vocational higher education programmes are compatible for recognition in the first (Bachelor) cycle. Any Bachelor’s or master's degree can be followed by specialised higher education courses (in Hungarian: szakirányú továbbképzés). These do not lead to another degree but offer the option of specialisation in a particular field of study. Courses can be studied full-time, part-time or through distance learning. A four-year doctoral programme is a post-graduate course to follow any Master’s or equivalent qualification. Hungary has a long tradition of higher education reflecting the existence of established knowledge economy. The established universities in Hungary include some of the oldest in the world, the first was the University of Pécs founded in 1367 which is still functioning, although in the year 1276, the university of Veszprém was destroyed by the troops of Peter Csák, but it was never rebuilt. Sigismund established Óbuda University in 1395. Another, Universitas Istropolitana, was established 1465 in Pozsony by Mattias Corvinus. Nagyszombat University was founded in 1635 and moved to Buda in 1777 and it is called Eötvös Loránd University today. The world's first institute of technology was founded in Selmecbánya, Kingdom of Hungary in 1735, its legal successor is the University of Miskolc. The Budapest University of Technology and Economics is considered the oldest institute of technology in the world with university rank and structure, its legal predecessor the Institutum Geometrico-Hydrotechnicum was founded in 1782 by Emperor Joseph II. The decline of Hungary's population that started in 1981 has also continued in recent years. According to the 2001 census, the population of Hungary was 10,198,000, about half a million less than the figure of twenty years earlier. By 2005 the population dropped to 10,077,000. The age pyramid of the Hungarian population is among the most irregular ones in Europe. On 1 January 2005, due to the extremely low number of live births in the preceding years the size of the 0-4-year-old population was smaller than the next age groups of five-year increments up to the age group 60-64. There are major differences in the size of the various generations. The official language of instruction is Hungarian, but a number of ethnic and national minorities (e.g. German, Romanian, Slovene, Serb and Croatian) have minority educational institutions with their own languages as first or second language of instruction at primary and secondary level of teaching. According to the 2003 survey, the rate of Romani children in the population entering school education in 2008-2009 is expected to be around 15%. A special feature of the Hungarian education system is that institutional structures and the structure of educational programmes are not aligned with each other. The system's institutional structure and the presence of programmes allowing early selection show similarities with Central European and ex-socialist countries. The system's content structure, the uniform and general phase of education has extended, and secondary level education may be characterised by increased opportunities for transition. The general phase of education lasts until the age of 18 in Hungary's education system. Participation in secondary education, offering a wide variety of programmes, is fairly high. Within secondary education, the proportion of students studying in programmes leading to a secondary school-leaving certificate and offering transition to tertiary education is around the international average. Pre-school 0 School-based programme for children aged 3–7. Includes basic skills development, pre-reading, drawing, singing, and school preparation. General school 1AG General school primary level, Grades 1-4. 2AG General school lower secondary level, Grades 5-8. 3CV 3-year apprenticeship training programmes according to the Education Act of 1985 starting after grade 8 of the general school. 1997/98 was the last year of new enrollments, because the new law does not allow dualsystem vocational education before age 16. Vocational secondary school 3AP Vocational secondary school programmes preparing students for secondary school final examination with pre-vocational elements, Grades 9-12 (13). Source: Statistical Yearbook of Education 2002/2003, OM, 2003. Notes: Destination for which the programmes have been designed to prepare students: A=access to further general education, B=access to further vocational education, C=access to the labour market. Orientation category is based on the degree to which content of programme has been specifically designed: G=general, P=pre-vocational, V=vocational. Public-sector institutions may only charge for services additional to their basic tasks, including for example extracurricular activities, meals, excursions, etc. Currently, the attendance rate with regard to the age groups 3-5, is just above 86%. The average duration of participation of children aged 3–7 in pre-primary education is just over 3 years (3.3), which is the highest average value in Europe. 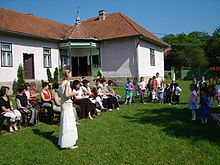 A Hungarian pre-school class having outdoor activities, March 2007. In Hungary a kindergarten is called an óvoda ('place for caring'). Children attend kindergarten between the ages of 3–6/7 (they go to school in the year in which they have their 7th birthday). Attendance in kindergarten is compulsory from the age of 3 years, though exceptions are made for developmental reasons. Though kindergartens may include programs in subjects such as foreign languages and music, children spend most of their time playing. In their last year children begin to be prepared to attend elementary school. Children start primary school when they reach school-maturity, usually in the year in which they have their 6th birthday (7th if they were born after May 31). Primary education can last for 4, 6 or 8 years. 8-year education is the most widespread; the other two options were introduced in the early 1990s. Subjects include literature, grammar, mathematics, music, art, Physical education, environmental studies (from 1st to 5th grade), biology (from 6th grade), geography (from 6th grade), history (from 5th grade), history of art, physics (from 6th grade), chemistry (from 7th grade), one or two foreign languages (usually English, German or French). Before 1990, Russian was compulsory. After finishing high school, students take a school-leaving exam (Matura or final exam, érettségi in Hungarian). From 2005 this consists of exams on five subjects: written exam in mathematics, verbal and written exams in Hungarian literature and grammar, a foreign language, history, and written and/or verbal exam in a subject of the student's choice. These exams also serve as an entry exam to universities and colleges. Many of the gimnáziums have begun to teach a foreign language intensively (usually 12-14 lessons a week) and IT (usually 3-4 lessons a week) in the first year. This is called nyelvi előkészítő évfolyam, literally "Language training class", or simply nulladik évfolyam (literally "0th grade"). After 2005, students will have less foreign language lessons and IT. At schools where there is no nulladik évfolyam (beginners classes), they may be required to introduce them because the majority of Hungarians do not speak more than one language, or only speak their parents' language or dialect. Most students will finish High School at the age of 18 or 19, or when they complete Year 13. Those who had at least an intermediate level language exam weren't required to pass a language exam at Matura, but has become compulsory since 2006. In language training classes, a student must pass an intermediate level language exam in the second year, and the same level Matura in the third year. Higher education is divided between colleges and universities. College education generally lasts for 4 years, while university education lasts for 4 to 6 years depending on the course undertaken. Vocational curriculum usually last 2 years: they are opened to secondary vocational school's graduates, and eventually vocational school students (after 5 years of work in the desired field or after a two-year program leading to a "secondary school leaving certificate"). University PhD courses usually take 3 years to complete. Before students get their degree, they must pass an intermediate level language exam in the foreign language of their choice. English and German are the most popular. The number of Spanish-learners has been growing in the last few years. Recently a high number of students chose Esperanto and Romani languages. Both are said to have a relatively small vocabulary and easy grammar. This school type (in Hungarian: szakiskola) typically provides general and pre-vocational education in grades 9 and 10, normally followed by three or two years of VET. At the end of their studies, students will acquire a qualification (ISCED 2C or mostly 3C). The cost of student accommodation in Hungary is lower than in most Western European Countries and Scandinavia. There are employment opportunities in the European Union during education years and after graduation, etc. Students interested in continuing their studies in Hungary will find preparatory courses in numerous universities from Debrecen to Budapest, from Budapest to Szeged, from Szeged to Pécs. ^ Eurydice. "Compulsory Education in Europe 2013/2014" (PDF). European commission. Retrieved 19 May 2014. ^ Medgyesi, M. (2007). The socio-economic environment of education. In Loboda, Z., Lannert, J. and Halász, G. (ed.) Education in Hungary 2006. Budapest: Hungarian Institute for Educational Research and Development. ^ "Review" (PDF). unesdoc.unesco.org. 2015. ^ National summary sheets on education systems in Europe and ongoing reforms. (2006) Brussels: Eurydice. ^ a b UNESCO-UNEVOC (27 October 2013). "Vocational Education in Hungary". Retrieved 19 May 2014. ^ "Student accommodation costs in Budapest"
^ Study-hungary.com: Why study in Hungary?